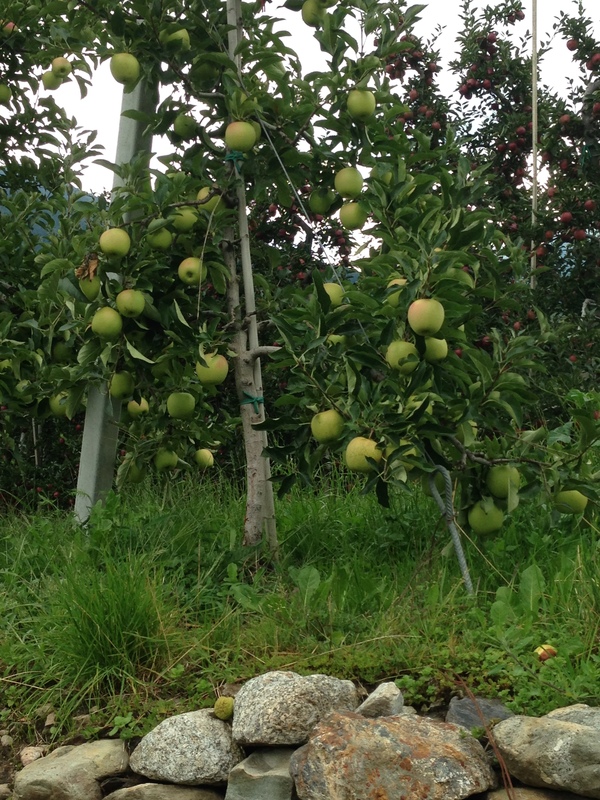 A Fruit Trail: From Market to Orchards, Sondrio Valley. Posted on November 12, 2014 by Veena S.
One morning in August, as we drove through the towns of Sondrio valley, Northern Italy, the pristine scenery of rugged hills and terraced slopes seemed like a perfect holiday spot. As we drove through the quaint towns, occasionally we spotted children on bicycles, old men at street corners, cigars in hand , adjusting their seats to catch the morning sun. Weekend had made the town of Valtellina very quiet. Till…… we suddenly stumbled upon a market! ‘Stop, stop. looks like it’s the weekend market.’I pleaded to hubby. ‘ A great place to pick up fresh fruit and bread for our drive up the terraced slopes, in search of our dream stay. ‘ Oh! it’s your blog again’ laughed hubby. A burst of activity unfolded: Vans offloaded fruit carts, women walked briskly with straw baskets, plants and pots arranged on the street corner, a giant van with cheese in 20 different varieties was screaming for attention. And the season’s fresh plump fruit was literally waiting to be devoured……rather ‘be bought’ Orange, yellow, purple and green. The Sondrio valley market was a hum of activity and riot of colour! This summer, the fruit studded the market : Nectarines, plums, persimmons, apples, kiwi fruit , tomato and pears. It all arrives from nearby towns of Valmalenco, Morbedo, Pegdirino in the Lombardy region. ‘Up there…along the slopes….’ said the lady pointing to the fertile region. The town itself borders the Swiss Alps, and is blessed with cool summers and mild winters. Valtellina abounds in vineyards and apple orchards, making it a popular home for the Lombardy nobility and rich farmers. Stall holders spoke mostly in French and Italiano – they were helpful in guiding us to the valley’s apple orchards. Trays of delicate, frilly mushrooms caught my eye. ‘How do you eat this? I inquired. ‘They are lightly buttered and sautéed before adding them to a pasta dish. And you must eat our local tagliatelle pasta – its’ called Pizzocheri’. I quickly scribbled the name on a piece of paper, knowing my memory would fade quickly this was almost a tongue twister pasta name, I thought to myself. Have you wondered where the Swiss cows feed ? And how many litres of milk make a kilo of cheese? To see a cheese factory, I would have walk up to the Swiss Alps as early as 3 am to see cheese making! Or else, join a tour guide and stay at the farms. Hmm…maybe next time. Till then, we settled buying a variety of cheese slices to nibble along the way. ‘Goat milk or buffalo milk?’ inquired the lady. Did we understand the difference? I smiled. Well, the taste and density differs, I learned. And thus began the trail from the market to the fruit orchards. We drove up into the hills, twisting and turning into small towns, stopping to admire bunches of red apples that peeked through branches, sometimes hanging in clusters of 4-5, weighing the branch down. Hundreds of apple trees in rows after rows, green red-brown – The colours of Nature. Apples, apples everywhere..on the branches, on the floor and crates full at corner stalls and markets. Finally, we halted at the Agri Turissimo lodge. Every moment rewarded with scenic views and fresh Italian meals. Our hosts: Frederika, Mirco and Deborah made us feel comfortable and personally cared for. The dining area ambience was created with a fire chimney and old traditional wood furniture. Sparkling wine glasses at the bar with candle lights created a romantic evening setting. The beauty was of course outdoors: one could sit on the wooden benches, admire the backdrop of mountains and sit nestled in the apple orchards. Truly natural. Misty walks in the morning into the fruit orchards were a perfect way to learn about the soil, annual flowering /fruiting time and fertilizer requirements. Before winter, its time for fruit plucking and sorting. This would be done entirely by hand. Coperatives collect fruit from each farmer and pack it for storage and distribution. Excess (low quality) apples are often sold in local town markets. Dozens of spoilt fruit litter the ground. The valley’s slopes are man’s testimony to the use of rough land. History notes how travelling monks cleared the woods, terraced the rugged slopes, irrigating them and planting rows of vineyards. The region, since then, produces the best wine in Italy ! Only the south-facing slopes receive the summer sunshine – making it much sought after by the nobility and rich farmers. Our hosts, Mirco and Frederika took us around their vineyards, and shared stories on a new hobby: bee-keeping . In summer they keep lined wooden boxes out in the woods, where flowers are blooming. Bees gather honey and buzz into the box. Honey is collected and stored in bottles, sold at the lodge and the local markets. Fresh bunches of grapes hanging from trailers. The region is home to best wine! A magazine highlighting the various grapes and the history of cultivation in Valtellina. Information about grapes used in wine making, Sondrio valley. Co-operative display boards for the Melavi Apple in the orchards. Some fruit makes its way to local markets, and neighbouring towns. Adjacent towns hold markets on different days of the week, thus sustaining cooperation and community approach to farming. Women often exchange recipes and social networking, they set up stalls with home-made jams, tomato sauce, honey and fruit tarts. Isn’t is a great way to meet new people and get to know the town people? We did just that…town hopping for dinner, sourcing popular local restaurants off the main streets. Having completed a trail from the market to the fruit orchards, from the honey bottles to bee keepers and savouring fruit tarts made by local women, it was time to say Ciao – goodbye to Nature’s bounty in Sondrio. Have you ever stayed at an Agri -Tourist accomodation? What was your experience? Posted on November 8, 2014 by Veena S.
I had promised my readers some local recipes on my return from Hyderabad and Mumbai. For a festive recipe from my home town Mumbai, see Besan Ladoos for Deepavali. Welcome to Hyderabad! The city of Charminar, the iconic building with four minarets and the popular Chudi Bazaar, Lac Bazaar and pearl markets in the old town areas. But it is the Hyderabadi cuisine, and the popular Biryani, that draws chefs and tourists from all over India! Pages from history describe the Nizam’s kitchen as elaborate and authentic, drawing the best of Khansama or cooks from the Mughal/Persian/Arabic lineage. It was the art of blending spices, mutton /lamb and slow cooking Tandoor methods used that created some finest dishes and best kept secrets. It is said, even the young ladies of the house were banned from entering the kitchen! Recipes were passed down ONLY to the incoming daughter-in-laws, and they would learn and guard them. Mirchi ka Salan, lentil soups, kebabs, Biryani, Rogan Gosht and sweet treats like Double ka Meetha and Qubani are some delicacies of the era. Another type of cuisine is the local Andhra food. Rice is staple diet, cooked in a variety of flavours. After the harvest, rice sweet /puddings are cooked traditionally using clay /earthen pots. For a Tamarind rice recipe, see here. Also popular are podi /chutneys/pickles that have a fiery, tangy element. Andhra people mix it with mounds of rice topped off with ghee and the fiery pickle to enjoy a hearty meal and some lip smacking. Beware you timid outsider…the experience might send your tummy rumbling and eyes tearing. Wash, dry and de-seed the chilli pepper and leave aside to dry. Prepare the stuffing – Coarsely grind the peanuts and sesame. Mix all the dry ingredients in a large bowl. Add 2 tbsp. of warm water to tamarind and crush the pulp to make juice. Add this as required to dry ingredients, avoid making it too soggy. Begin filling the chilli peppers one by one, set aside on plate. Heat oil in large wok /frying pan – do not smoke it! Prepare the batter by mixing ingredients with small amount of water, at a time, to make a thick, pouring consistency. Take one chilli pepper at a time, gently dip and rotate it in batter, coating it on all sides. Put it into the hot oil. Do same with remaining. Fry gently, turning it so as to give even heat and cook chilli on all sides till brown. Remove from frying pan using large sieve ladle, draining excess oil. Set aside on plate. To serve, garnish with chopped onion and lemon slice. Serve whole or sliced diagonally in half keeping th estem intact. Best served with frothy, milky Chai. Tip: If preparing 1 hour ahead of party, pre heat oven to low temperature, line aluminium foil on tray. Place Pakodi/ Bajji on them. Keep warm till ready to serve.